It may seem quite odd that I would begin this week with a post about something made of flour and water after openly admitting to my inability to bake, rattle, and roll. But I assure you, when it comes to a round ball of dough, I think have a bit more skill, or at least confidence. And in conquering this basic yeast bread, I was able to open the door to a sodium free version of something that I dearly missed: soft-baked pretzels. I am a city girl. I love the rush of busy streets and the buzz of passing cars. I like tall buildings and commuting by subway. Most importantly, I love street food. Well, make that “loved” street food. Toasted almonds, steaming hot dogs, and soft-baked pretzels with grainy mustard on top – these were a few of my favorite things. While two of the three are long-gone loves, I recently began rethinking the possibility of the pretzel. The only thing that was standing between me and this treat was baking powder or baking soda and I already knew there was a low sodium substitute for those ingredients. So this twisted sister had low sodium potential. It was just a matter of me putting on my apron and making it happen. A year ago, I bought a low sodium soft pretzel mix (0 mg of sodium) from a low sodium website and it has been sitting in my cupboard ever since, waiting for its moment to shine. I thought that this was it, the experiment that would bring my long-forgetten purchase out of hiding, but after a pang of prepackaged guilt, I decided to forget the mix and make these little ladies from scratch. With a little help from Epicurious.com, I found a simple New York pretzel recipe that was easily altered to be sodium free. 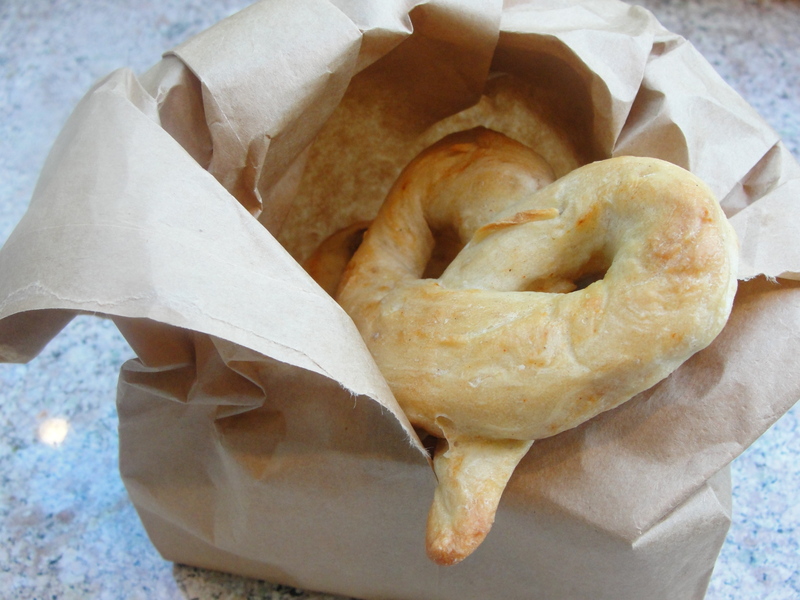 I know what you are thinking: a pretzel is not a pretzel without the chunky sea salt on top. But just hold your horses for a second. There is a low sodium solution to this dilemma. To make up for the flavor, I added granulated garlic, red chili peppers, and a dash of smoked paprika. 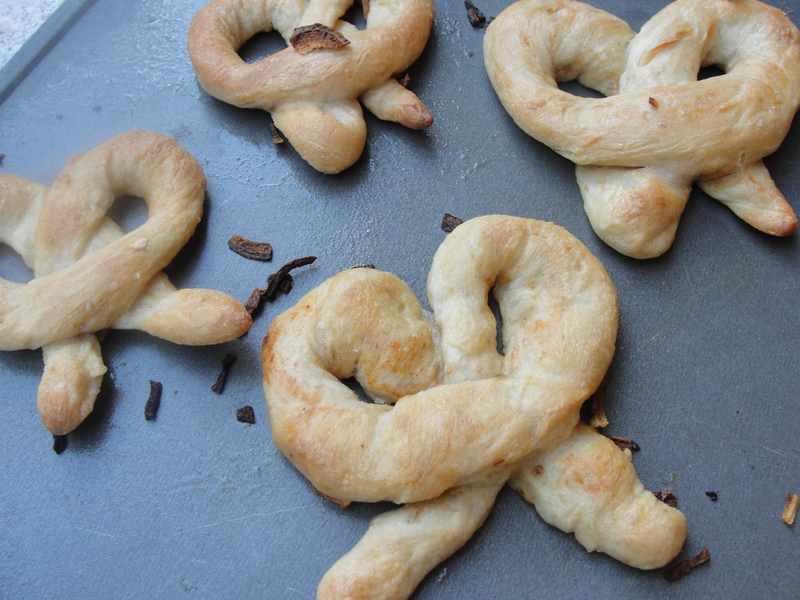 And to mimic the texture, I covered the pretzels with dried onion flakes. And there you have it. Savory, soft, and low sodium. Different but entirely satisfying. These heart-shaped treats were a success and really fun to make. One word of warning, though, they do go stale quickly and have a shelf-life of two to three days at most. But don’t be afraid to use only part of the dough and save the rest for other baking adventures. I used my leftovers to make some pizza dough that I covered in ricotta cheese (20 mg of sodium) and sauteed kale. It would also work well as bread sticks, hot crossed buns, and probably bagels. 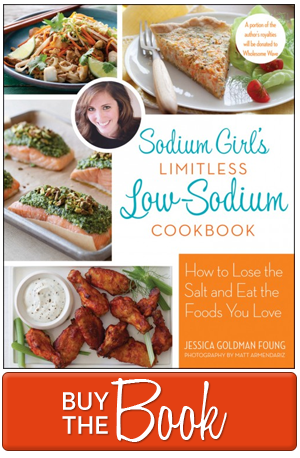 Let your imagination run wild and conquer those low sodium barriers. And the next time you hurriedly pass a cart of freshly baked soft pretzels, take a second to check out who’s manning it. It might just be me. Chow on. 1. Stir together sugar, yeast, and 1 ½ cups of lukewarm water in your mixing bowl and let stand until foamy, about 5 minutes. 2. Add 3 ½ cups flour, chili peppers, granulated garlic, and smoked paprika to yeast mixture and stir until it forms a dough. I used a stand mixer and the dough hook, but if you have large biceps and patience you could definitely do this by hand. You will have to knead the dough after mixing, adding additional flour until the dough is smooth but sticky. 3. Leave dough in bowl and cover tightly with plastic wrap. Allow the dough to rise in a draft-free, room-temperature place for 45 minutes or until it has doubled in size. 4. Find a flat work surface where you can work with the dough. Flour it well. 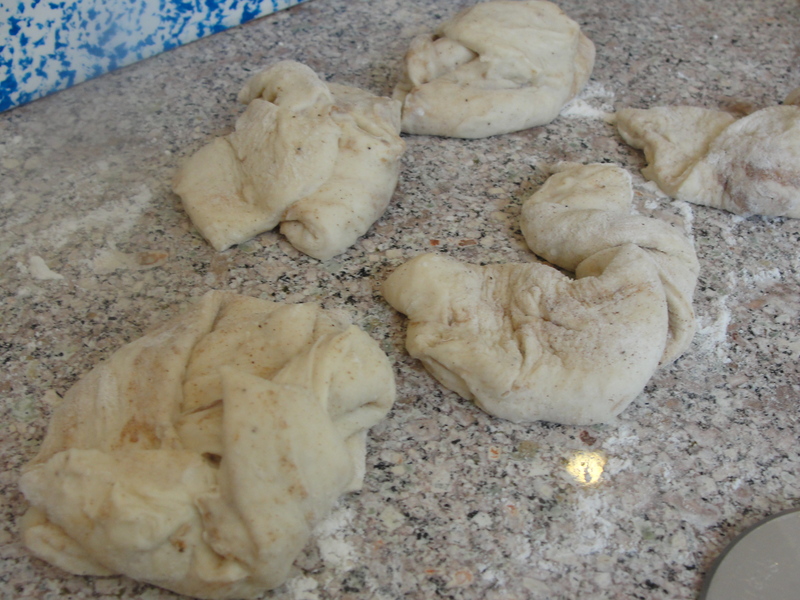 Lightly roll out the dough until it is a big square that is 1/4 to 1/2 inch thick and cut into 8 equal pieces. To make mini pretzels, cut into 16 equal pieces. 5. Channel your inner kindergartner and using your palms, roll 1 piece back and forth on a clean dry work surface into a rope about a foot and a half long. If dough sticks to your hands, lightly dust them with flour. 6. 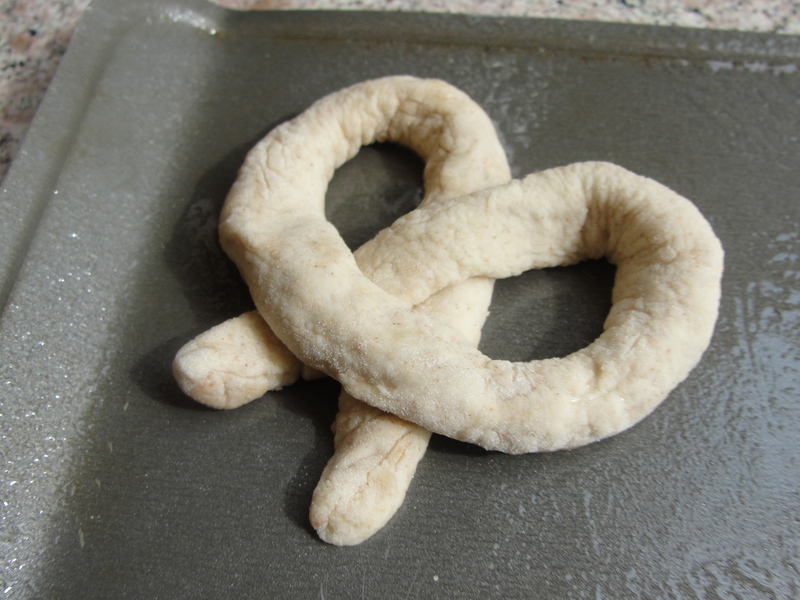 Twist dough into a pretzel shape and place finished pretzels on an oiled baking sheet and continue until you use all the dough. 7. Let pretzels stand, uncovered, about 20 minutes. 8. While the pretzels rest, put oven rack in upper third of oven and preheat to 425°F. Bring a wide 6-quart pot of water to a boil. 9. Using your hands or a spider skimmer, slide 3 pretzels, 1 at a time, to boiling water and cook. 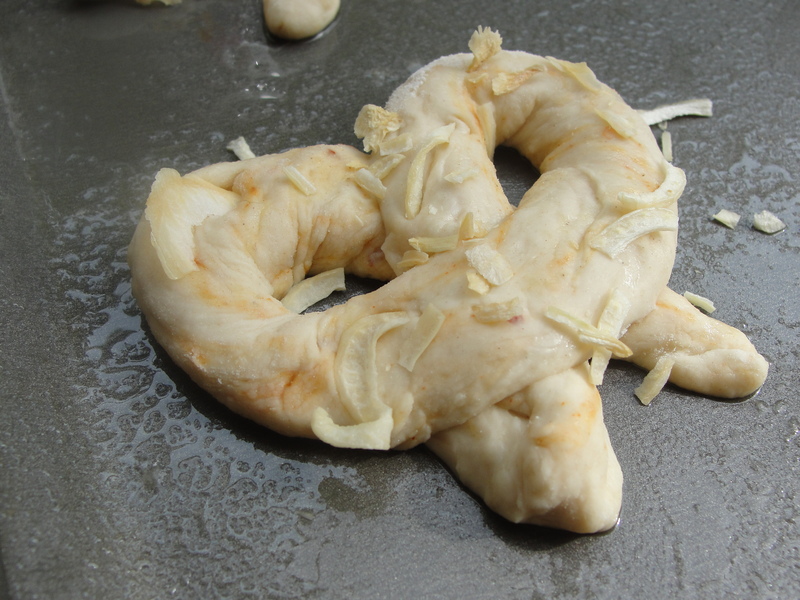 Turn over once with tongs, until pretzels are puffed and shape is set, about 3 minutes. 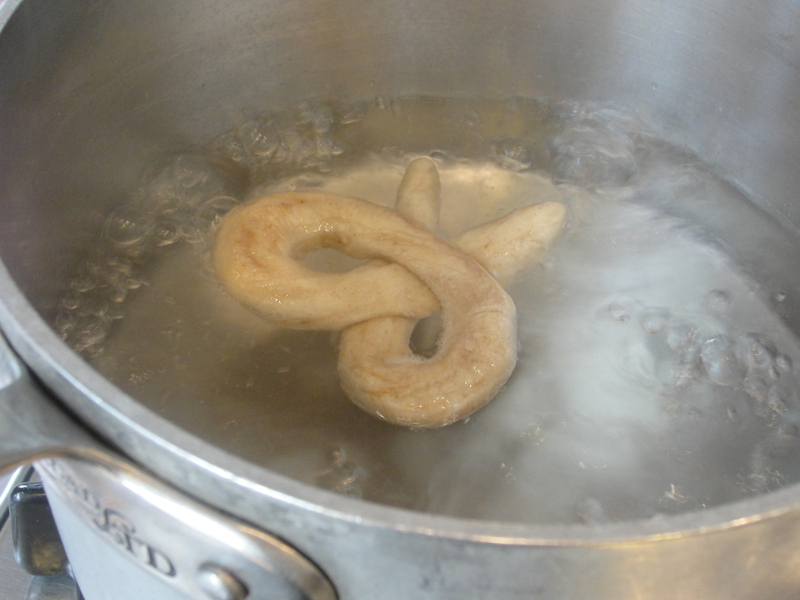 Transfer parboiled pretzels to a rack to cool. Repeat with remaining pretzels. 10. Return the pretzels to the oiled baking sheet and brush them lightly with some of egg and sprinkle with dried onion. 11. Bake until golden brown and lightly crusted, about 35 minutes. 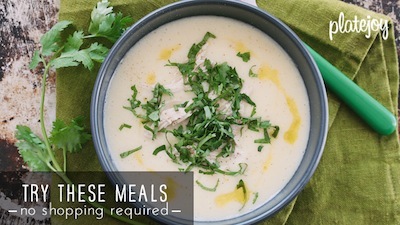 Cool 15 minutes, then serve warm. looks like a delish snack! Yum, yum, those pretzels are beautiful! Did you try them with any no sodium ketchup? No I didn’t! I thought I was going to have a dipping frenzy in some low sodium mustard, but they ended up being so savory delicious on their own that I ended up eating them as they were.